Despite the growth in tablet ownership and diversity of devices available, recent tablet owners seem to be embracing the devices in ways similar to the first generation of tablet owners. Most who own tablets-both early and late adopters – have integrated the devices into their routines on a daily basis. 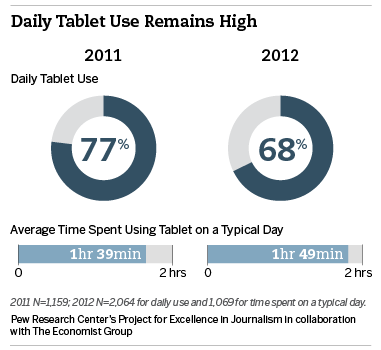 About two-thirds (68%) use their tablet every day, down from 77% a year ago. They also use them for a significant amount of time each day. In all, tablet owners spend an average of 1 hour and 49 minutes on their tablet on a typical day. That is nearly identical to the average of 1 hour and 39 minutes in 2011.
iPad owners, according to the data, use their device more than Android owners. About half, 54%, of iPad owners use their tablet several times a day, compared with just a third, 33%, of Android owners (and 40% of Kindle Fire owners.) These differences may ease over time, however, as more tablets are introduced with hardware, battery life and capabilities equivalent to those of the iPad. How people use their tablet also has remained substantially the same, even as the tablet-owning population has doubled. News is a large part of what people do with their mobile devices. Fully 64% of tablet owners get news on their devices at least weekly, including 37% who do so daily. The numbers are similar for smartphone owners – 62% consume news weekly or more and 36% do so daily. 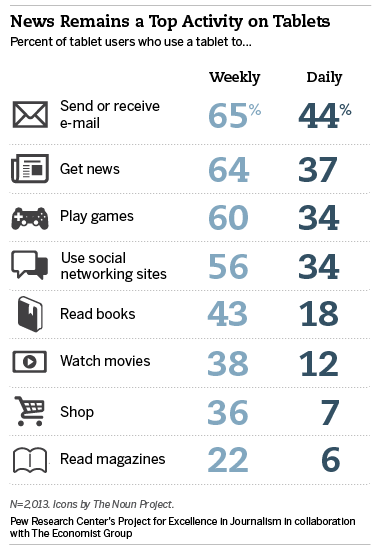 For both tablets and smartphones news is among the top activities people engage in on the devices. The amount of time spent on these devices getting news is also substantial. Mobile news consumers spend an average of 50 minutes or more getting news on their tablet or smartphone on a typical day. 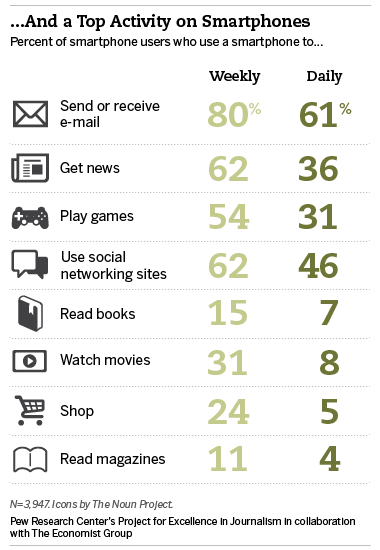 For activities other than news, though, people tend to look to one device more heavily than the other. Far more use their smartphones, for instance, for sending or receiving email – 61% do so daily on their phone, compared with 44% on the tablet. More also turn to their phones for daily social networking updates – 46% versus 34% who do so on the tablet. Perhaps not surprisingly, for reading – both books and magazines – people look to their tablets, but not exclusively. The survey found that 7% of smartphone owners read books on their phones daily and 15% do so weekly. That compares with 18% of tablet owners who read books daily on their tablet and fully 43% who do so at least once a week. These tablet numbers remain about on par with a year ago – even with the introduction of technically advanced e-readers, such as the Kindle Fire. With lingering issues surrounding Flash technology and the lack of cellular connectivity (as opposed to Wi-Fi which comes standard) on most tablets, video watching of any kind has also remained about on par with a year ago. Just over one-in-ten, 12%, watch videos daily-a percentage that corresponds closely to recent data from comScore. The new survey suggests that while news remains one of the most popular tablet activities, the number consuming news regularly on the devices is lower now among this broader population using a wider array of devices than it was a year ago among the first adopters. Weekly news consumption, for instance, has declined from 77% of tablet owners to 64% in the new survey. Daily news consumption on the tablet has also declined. Some of this decline may be tied to lower daily news consumption among Android tablet owners, the data indicate. Only 29% of Android owners get news daily compared with 43% of iPad owners. Android owners also are less likely to use their tablets for many other activities on a daily basis, including social networking (28% vs. 38% of iPad owners) and email (34% vs. 56% of iPad owners). On the other hand, Kindle Fire owners are the most likely to read books daily (34% vs. 13% of iPad and 13% of other Android owners). There are also some differences in tablet use by gender. Men are more likely to get news on their tablets every day than women (43% versus 32%). Women on the other hand are twice as likely as men to never user their tablet for news (21% versus 11%). Men also are more likely to get news daily on their smartphones. Those numbers conform with historical data about news consumption by gender generally, particularly newspapers. comScore. "Majority of Tablet Users Watch Video on their Device, 1 in Every 4 Viewers Pay to Watch." June 8, 2012.